After Super Tuesday, the race for the Democrat nomination looks deadlocked. 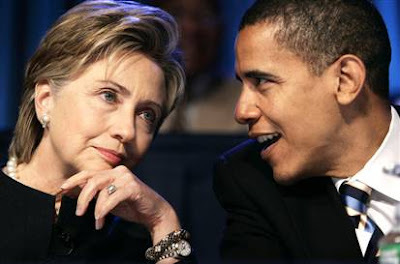 Barack Obama clearly has the edge, in both money and momentum, and certainly in charisma, but Hillary Clinton still has powerful backers, a strong appeal to women, and greater depth of experience. It remains possible that the two will fight each other to a standstill, splitting the Democrats from top to bottom and ruining each other's chances in the process. Here's a suggestion which any Democrats reading this might like to consider. Let them both run for President. If no clear winner emerges in the next few weeks, the Democratic Party should admit the fact, endorse both candidates, split the funding and the party machinery equitably between the two, and spin the indecision as a triumph of openness. We're just spoiled for choice, they should say. Both, in their ways, are outstanding candidates. John McCain isn't. He has many fine qualities, and a history of courage both personal and political. But he's far too old, and looks it. Half the Republicans hate him anyway. The real battle is between the Democrats. A strong contest between Clinton and Obama could make McCain look like a sideshow. Both would be free to play on their strengths, and appeal beyond the usual party loyalists. Obama especially. If this happened, moreover, the most likely upshot would be that a dissenting Republican, perhaps Romney with his millions, would re-enter the race as an Independent. It would be utterly compelling, invigorating, unpredictable and democratic. Of course it won't happen. But it should. Your blog deserves far more comments than it gets! Given the title of this post, and the two politicians pictured, i thought this was going to be about eating babies, like its Swiftian namesake! There's a saying on Cif, "the fewer the comments, the better the article". That's what I cling to, and the fact that my stats are steadily going up. They come, they read, they sod off. Perhaps I'm just so unarguably right, there's nothing to add. I thought the same when I first came to this blog: Why is no-one commenting on this excellent, thoughtful prose. And then when I wanted to make a comment, I found all I really wanted to say was "Exactly!". I don't want to inundate the Heresiarch with "Me too" posts. Many things have me shouting at the screen these days, but very few have me shouting "Yes, that's the point!" I did find something I disagreed with yesterday, but it was in a rather old post (I came to this blog only recently after the reference to it in the Guardian following the "marrying twins" story). If I find it again I will post a comment there. The reason it won't happen is that the Democrats aren't that dumb. If it _did_ happen, then the Republican candidate would win. Even if John McCain got hit by a bus and died, and his place were taken by some terribly unqualified VP candidate, that candidate would win. The US system where the winner of the largest plurality gets 100% of the power necessarily forces us into a 2-party system. Votes for a 3rd party aren't just wasted, they have the effect of changing policy AWAY from what you'd like to have happen by decreasing the support for the least-bad option (which you would otherwise have voted for). Unless your third party gets at least 33% of the vote it is actively harming its cause just by existing. Then once the system is solidly entrenched in a 2 party system, there are only two ways to gain votes. One is to siphon off on-the-fence voters from the other party by moving toward the center: the effect tends to cause the two major parties to have very similar platforms. The other is to "energize your base" and get more people to turn out -- and this wouldn't even work if it weren't for the fact people are so dissatisfied with the US election system that most of them don't vote. This is not to mention the restrictive ballot access laws in lots of places that say Democrats and Republicans get on the ballot "for free" but others have to do extensive and difficult petition drives to be added, then defend these in court.